In the film Pacific Heights the character played by Michael Keaton moves into an apartment and then becomes the worst tenant ever. The tagline for the film is : "It seemed like the perfect house. He seemed like the perfect tenant. Until they asked him to leave." I don't want to spoil the movie but suffice it to say that removing the tenant was difficult. The story in that film is what many people think the eviction process is like. The story makes for an entertaining movie, but its not a very realistic or common example of an eviction. While eviction can be time consuming and costly it usually isn't the horror story that it is made out to be. Furthermore most evictions that take a long time and cost a lot could have been handled quicker and for less money if you know what you're doing and do things right. I think one of the reasons so many people think evictions are horribly expensive and time consuming is that they are hearing horror stories from evictions that were done by someone who isn't experienced at the process. The first time you do an eviction as a landlord you are new to the process and likely to make mistakes. The eviction process isn't simplistic exactly and since you're dealing with the laws and government bureaucracy you need to play by the rules. Its very easy when doing an eviction to make mistakes and those mistakes will cost you time and probably money. If you properly research the process and get help when needed then the eviction process doesn't need to be excessively expensive or time consuming. I should take a moment to point out that that the laws and processes governing evictions are different from state to state and can also depend on local laws. For this article I'm making generalizations about the process that I believe are commonly true, but your exact situation will depend on the laws for your state and/or city. In most areas evictions could be completed within a month or less. Usually courts have setup the process so that it isn't excessively long and the court process if necessary is often informal without the need for lawyers. The cost of evictions will vary but can often be as low as the cost of a court fee or often free of cost entirely. Don't get me wrong, evictions are definitely a pain and a hassle. Its certainly one of the negative parts of being a landlord. Evicting someone who isn't paying rent or has otherwise broken your lease rules is not something to enjoy of course. Landlords like tenants who pay their rent much more than a potentially expensive eviction. Doing what you can to avoid eviction in the first place is the best strategy. But sometimes evicting a tenant is unavoidable and necessary. One of the things about evictions that I think is a myth is that every eviction will end up in a costly court battle. My father has owned rentals over three decades now and he has had to evict tenants on occasion. With rare exception he hasn't had to do anything more than post a 3 day eviction notice. I'd say probably 90% of the time a tenant will leave or pay due rent after that 3 day notice with anything more required. I only recall a couple times that my father has actually had to get the sheriff to remove a tenant. Evictions can certainly be potentially expensive. Costhelper says that a medium price for serving papers and court fees can run $400 to $700 or if you have to go to trial and hire a lawyer then you can spend $500 to $1000 for an uncontested eviction. Worst case scenario you could end up in a court battle with a contested eviction and pay $3000 to $5000 in legal fees. So you could be spending quite a bit of money, but from what I've seen most evictions don't require actually going to trial or hiring lawyers so the costs should usually be at the lower end. What is worst during eviction is the cost of lost rent. For every month it takes to evict a tenant that is a lost month worth of rent. So if you take a long time then it will compound your costs. You can take as long as you want to do an eviction. If you're slow or make lots of mistakes then it could take virtually forever. But generally if you do things property and quickly then you can minimize the time to evict. The time it should take to do an eviction is another thing dependent on the law of the city and/or state in question. An article from ABA family legal guide says that "Thus, the eviction process from the end of the notice period can take from five weeks to three months." Day 18 - step 4 : First court appearance held. If either party fails to show up eviction stops. So basically thats about 1 month from start to finish. But this varies some. It could take longer if the landlord doesn't do things very fast or if you make mistakes. You could also see some steps go faster if the courts are doing things quickly. And again you have to realize that the laws vary from state to state so the timeline in your state may differ greatly. As another example check out this eviction flowchart with time estimates for California. Looking at that flowchart it could take as little as 3 weeks for an uncontested eviction to maximum of about 2 months if it goes to trial. 1. Be careful in selecting tenants. Careful tenant screening can help you avoid problem tenants and will ultimately cut down on your evictions. See my previous article about how to find 'good' tenants. Of course no amount of screening can avoid all problems but the more careful and selective you are with tenant selection then the better your odds will be. 2. Educate yourself on the process in advance. You should read your state and local landlord and tenant laws in advance so that you fully understand the nature of the eviction process. Make sure that you know what the steps are in the process and the timeline for each. This is a key part of getting an eviction done effectively. 3. Don't delay. I'm guessing most landlords who take multiple months to do an eviction of a tenant include the time they delayed before getting the eviction process started. If you wait a week or a month before you post an eviction notice then thats an extra week or month you've added to the timeline. Then once the eviction process is started you should make sure to do every step as soon as legal. Every extra day you delay to post a notice or serve a paper will delay your eviction. 4. Hire help at least your first time. You can hire a service who will do part or all of the work to evict a tenant. There are some businesses that specialize in the eviction process and there are property management firms that do it as one of their services. I'd especially recommend hiring professionals to help you through your first eviction. After your first eviction if you learn the steps involved and feel you can/ want to do it yourself then you might try handling everything yourself if you need to do it again. 5. Avoid Shortcuts. Forcible eviction or other creative means of attempting to evict a tenant are usually not legal. For example a landlord can not shut off utilities in order to attempt to evict a tenant. 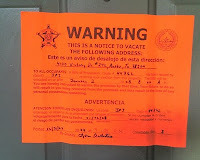 Usually physical eviction can only be done by law enforcement, often the Sheriff does this. So the landlord can not remove all the tenants belongings when the tenant is away and change the locks. As a landlord I would prefer to never have to evict anyone. But if you do have to evict a tenant then its important to handle the process property to avoid wasting lots of time and money. If you plan the process, educate yourself and seek qualified help when needed then you can keep the eviction process from being overly expensive or time consuming.